The results, as with last year, are delightful, in the most literal sense of the word. We have writers from almost every continent, poets from the past, essayists who are concerned for the future, and novelists desperate to understand the now. I participated last year, but was unable to join in this year. However, two Millions contributors took part. Garth selected Vasily Aksyonov (I read Generations of Winter on Garth’s recommendation almost two years ago and was blown away by it). Garth also selected Patrick Chamoiseau and Jay Cantor. Andrew, meanwhile, nominated a pair of Candian writers, Trevor Cole and Kenneth J. Harvey, with his premise being that all too often writers from north of the border get short shrift down here. In 1886, Anton Chekhov wrote a letter to his brother enumerating the following requirements for his own writing:Absence of lengthy verbiage of political-social-economic natureTotal objectivityTruth descriptions of persons and objectsExtreme brevityAudacity and originality; flee stereotypesCompassionI like to present this list at the start of any fiction writing class because it’s wonderful conversation fodder. Everyone has one they cherish (for me, it’s compassion), and one they revile (as my students recently pointed out to me: Can anyone every be totally objective? Isn’t the fleeing of stereotypes stereotypical?). After a discussion of this list, I have my students replace one or two of Chekhov’s rules with their own. Popular answers include: passion; avoidance of adverbs; write what you know; write what you don’t know; and humor. I always add “Bold use of metaphor” – whatever that means. If I were to revise Chekhov’s list, I’d take the “extreme” out of “extreme brevity.” Too wordy.Perhaps Chekhov hadn’t read Edgar Allan Poe’s famous 1842 review of Nathaniel Hawthorne’s Twice Told Tales, in which he advised, “Extreme brevity will degenerate into epigrammatism.” I have a feeling that Ernest Hemingway did catch this warning, though, for when he was challenged to write a story in six words, he took old Poe to task with this:”For sale: baby shoes, never used.”I love Hemingway’s story – how it attests to the power of implication! For a long time, I thought it very sad, until author Antoine Wilson schooled me otherwise. Now I appreciate it even more.As pointed out on this blog a few days ago, Smith, the online magazine devoted to storytelling and personal narratives, is publishing a compendium of 6-word memoirs by various authors (some of them were previously compiled in the 2007 edition of The Best American Non-Required Reading.) My favorites include Drew Peck’s “Ex-wife and contractor now have house” (which follows in Hemingway’s footsteps of implication), and Bob Redman’s “Being a monk stunk. Better gay” (for its musical qualities). All entries are fun, and they make you want to try writing one.I myself am terrible at the six-word story, autobiographical or not. Perhaps that’s the real reason why I don’t want the “extreme” in my “brevity.” I use as few words as a story requires – but sometimes a story requires a lot of words. Isn’t that what writers of the long short story – such as Alice Munro or Deborah Eisenberg – might tell you? But Poe warns against this, too, for “the sin of extreme length is even more unpardonable.”Uh oh. Sometimes I think Mrs. Millions prefers to ignore my blogging obsession – I do get the occasional eye roll – but then she goes and surprises me. Ain’t she the greatest? So, yesterday, thanks to our car being in the shop, Mrs. Millions was stuck with a long bus ride from near downtown to our neighborhood on the north side. I was going about my business when this text message arrived on my cell phone: “Sighting. The ultimate book on how to draw robots.”Hilarious. But now, of course, it must go on the blog. Mrs. Millions tells me you couldn’t miss the guy because how often do you see an Ignatius J. Reilly type reading a robot art book on public transit. Well, probably more often than you’d guess. Of course being obsessive about these things, I had to quiz Mrs. Millions so we could determine exactly what the book was. Turns out it’s called You Can Draw Transforming Robots (You Can!). Those are the best kind of robots. I’m mostly working from home these days, which doesn’t afford me much opportunity to engage in my favorite Chicago hobby, public transit bookspotting, luckily, Mrs. Millions is picking up my slack. As usual. Last week, my New Yorker didn’t show up. This has happened a handful of times in the close to ten years I’ve been reading the magazine. Typically, wherever I’ve lived, my issue has landed in my mailbox between Tuesday and Thursday. If I haven’t gotten my issue by Thursday, I tense up a bit and begin to plan, setting some time aside for a run to a bookstore or newsstand so that I don’t fall behind and so that my gnawing yen for the New Yorker is satisfied.But over the last decade, my New Yorker addiction has felt burdensome at times. I like to read – a lot – and yet with busy work schedules and other demands, I don’t have as much time to read as I’d like. And though my Reading Queue occupies several linear feet of shelving, I still find myself devoting about four days a week to the New Yorker (which I read all the way through, skipping only reviews of theater, dance, and music). Being the best magazine in the world, the New Yorker is guaranteed to provide me with at least one transcendent reading experience per month, often more than that, and very few clunkers. It is exceedingly rare that I quit reading an article halfway through. Still, though I love it so, I sometimes grow resentful of the time I must devote to the New Yorker and I sometimes fantasize about the day I’ll decide not to renew, though even formulating the reasons behind such a rash act is difficult.And so this week, when Thursday rolled around and my mailbox was still empty, I again felt that nervous pang and began to set aside some time for the ten-block walk to the Barnes & Noble. But then, I thought about it some more, and decided to miss this week’s New Yorker (though it may still arrive inexcusably late). So far, I feel pretty good, no withdrawal symptoms, and I think, if the day comes that I have to give up on the New Yorker entirely, I’ll survive, bonobos be damned.Update: That missing issue turned up after all. 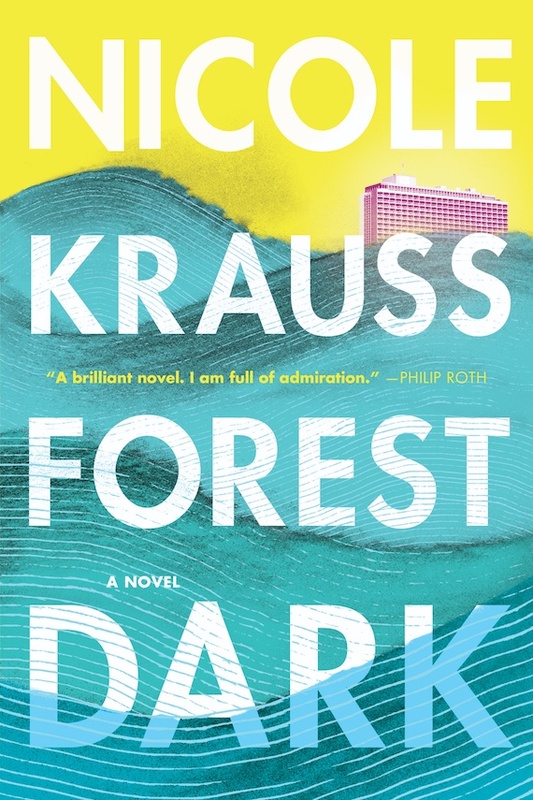 Nicole Krauss is back with her first novel in seven years. Forest Dark “interweaves the stories of two disparate individuals — an older lawyer and a young novelist — whose transcendental search leads them to the same Israeli desert.” The cover of Krauss’s new offering sports cool blue waves (dunes?) and the now-ubiquitous yellow, centering a truly killer blurb from Philip Roth. Krauss was a National Book Award and Orange Prize finalist for Great House, and The History of Love won the Saroyan Prize for International Literature. Forest Dark will be published by HarperCollins on September 12. A week doesn’t go by that there’s not some new news related to Dan Brown’s The Da Vinci Code. The plagiarism court case, the book’s paperback release, and the book’s connection to the recently discovered “lost Book of Judas” have all made headlines recently. Not bad for a book that first came out over two years ago. People wonder how the book can continue to sell so well (the paperback sold as many as 500,000 copies in its first week of release), but being on the front page of the newspaper every week goes a long way when you’re trying to move product. Incredibly, with the The Da Vinci Code movie coming out in May we’re actually in for another round of news about the book. Undoubtedly the movie will get tons of press, but I was particularly surprised to see that Google is participating in a special promotion for the movie. If you go to google.com/davincicode and follow the prompts, Google will add “The Da Vinci Code Quest” to your personalized homepage (assuming you have a Google account.) The “Quest” is some sort of puzzle game that officially starts on Monday and there are various prizes being offered. Now, Google has certainly morphed into a pretty big company over the last couple of years, but you don’t really expect them to do promotional tie ins. Once again, The Da Vinci Code seems to be rewriting the rule book.Philipp’s got more details.